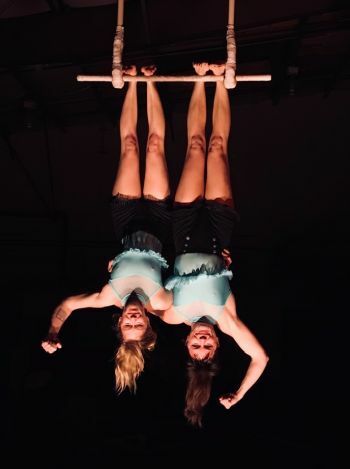 Sadye and Heidi met for the first time at Bellingham Circus Guild’s My Circus Valentine 2016 and began working together on duo trapeze later that year. They sure do love hanging out together, in addition to organizing Vaudevillingham (BCG’s monthly show,) they also co-produce the annual BCG Halloween show, and my what a great time we always have. Sadye lives at the Lookout Arts Quarry and used to hop trains with her former circus troop the Runaway Circus. She’s been practicing, performing and teaching circus arts for the past 13 years, and is the creator of Dorky Dance Fitness, which has been dubbed the “future of fitness” by King 5 news. Heidi has a goldfish named Fluffy and when she’s not circusing she can be found watering plants or being chased around by raging twins, an eye roller, and a booger eater. In answer to the question that everyone is dying to know, yes, their bunions are real.